Godaddy and Hostinger, both are pretty well known web hosting service providers. Though Godaddy was launched in the year 1997, 7 years before the Hostinger came into existence, Hostinger has earned quite a name for itself by providing quality services for affordable prices. Godaddy Inc. is an American publicly traded internet domain registrar who also provides web hosting services. Godaddy has over 17 million customers and has a huge team of over 6,000 employees worldwide. Hostinger belongs to the Hostinger International, Ltd. group which is an employee-owned web hosting provider which also provides domain registrar facilities. Hostinger has over 29 million users around the world and has its subsidiaries in over 178 countries. Hostinger group is also the parent company of three other major web hosts named 000webhost, Niagahoster and Weblink. Hostinger was earlier known as Hosting media which was changed to “Hostinger” in the year 2011 when they surpasses their first 1 million customer count. These introductory facts clearly prove that both these hosts have been in their business for quite a long period and know their stuff pretty well. If you are confused between Godaddy and Hostinger and want to know which one you should go for, here we have compared Godaddy vs Hostinger on the basis of multiple web hosting performance criteria which will help you to decide which plan to buy from which web host. Since both the hosts are competitors of each other, they tend to provide the cheapest prices and highest quality of services to gain and retain their customers. Still people who find it difficult to choose one of these two hosts, can easily make a choice by comparing hosting plans provided by both hosts side by side. Here we have listed and compared all the plans provided by both web hosts under their shared hosting category. 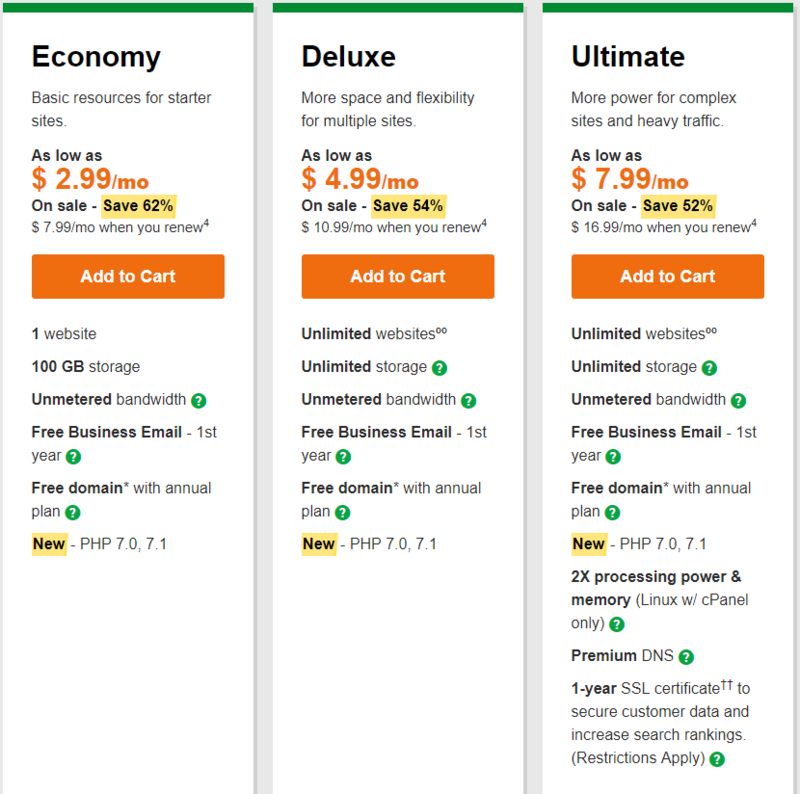 The first and the most basic plan provided by Godaddy is names as Economy and comes for a price tag of $7.99/month. The Economy plan provides the basic resources required for starter websites. With this plan you get hosting for 1 website along with 100gb of storage space and unmetered monthly bandwidth. You also get free business email for the first year of subscription. Similarly the most basic plan provided by Hostinger is named as Single shared hosting and comes for a mere price of $0.80/monthly, But to get this price you need to buy this plan for a minimum of 48 months. If you buy this plan for 3 months which is the minimum span for which you can buy the plan, you need to pay $2.15/month which is still costly than Godaddy’s economy plan (Since Godaddy Economy plan is available for $1 per month under the current promotion). Hostinger provides hosting for 1 website with this plan with 10gb of SSD storage space. You get a metered bandwidth of 100gb per month unlike Godaddy who provides unmetered bandwidth irrespective of the plan you choose. You also get 1 MySQL database and one email account. 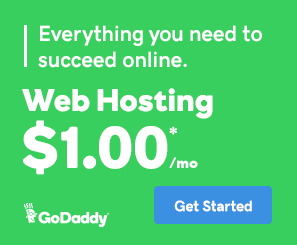 Godaddy’s second plan is named as Deluxe and costs $10.99/month and is suitable for hosting multiple websites with decent amount of monthly traffic. In this plan you get all the features of the Economy plan and in addition to that you also get hosting for unlimited number of websites along with unlimited storage space and unlimited subdomains. The second plan provided by Hostinger is named as Premium Shared Hosting and comes for the price of $2.15/month but if bought for a period of 48 months. Otherwise if you buy it for 3 months the price increases to $4.45/month. With this plan you get twice the processing power and memory as compared to the single shared hosting plan. You can host unlimited websites with this plan. You also get unlimited SSD storage space, unlimited bandwidth and unlimited MySQL databases. You also get a free domain with this plan which you can register while checking out. Some other features that you get with this plan include free website builder and a unlimited email accounts. The third plan provided by Godaddy is named Ultimate and is suitable for complex websites having high amount of monthly traffic. It is priced at $16.99/month and has all the features provides in the deluxe plan. In addition to those features you get 2x processing power and memory along with free SSL certificate for 1 year. You also get free Premium DNS and unlimited databases. Hostinger’s third plan is named as Business Shared Hosting and costs $3.45/month if bought for a period of 48 months whereas for a period of 3 months it costs $6.75/month. With this plan you get 4x the processing power and memory. With this plan you can hosts unlimited number of websites and you also get unlimited SSD space and bandwidth along with unlimited MySQL databases. You also get free SSL certificates and daily backups. Some other features that you get are unlimited email accounts and easy website builder. Godaddy has one more plan named as Maximum which is priced at $24.99/month and has the same price at the time of renewal too irrespective of the period which you buy the plan for. With this plan you get all the features of the Ultimate plan plus 2x more power and more memory. Websites hosted with this plans can handle 2x the traffic amount and you also get Free SSL certificate for the full period for which you but the plan for. This plan is most suitable for complex websites that host high-resolution photos and videos. Some things which are common to both the web hosts and all the plans is that you get 99.99% uptime and 24/7/365 support along with a powerful feature rich control panel. 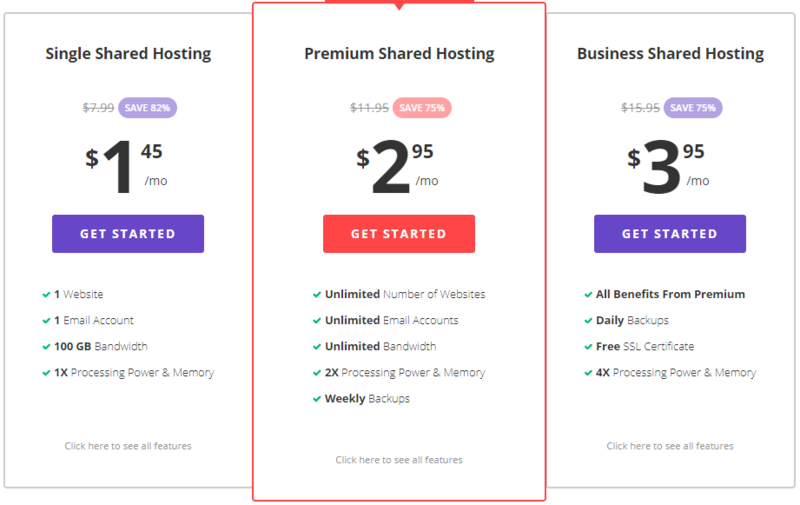 By comparing all the plan provided by both the web hosts we can conclude that Hostinger pricing is lower compared to Godaddy with better feature offering (Atleast on paper). We will compare the hosting performance of the both web hosting provider below in this comparison. Cheap plans might attract you to buy the plans from a particular host but with cheap plans comes the danger of getting an unreliable and not up to the mark service. The best way to determine whether a web host truly provides the true value for money or not, is to check the performance of the web host. Here the term value for money is of utmost important as you should keep the price in mind and then judge the host as you can’t expect all the features and top notch performance for fraction of the price. Better performing servers cost more money and so we need to look at the web hosts for the performance that they provide in accordance to the prices they charge. 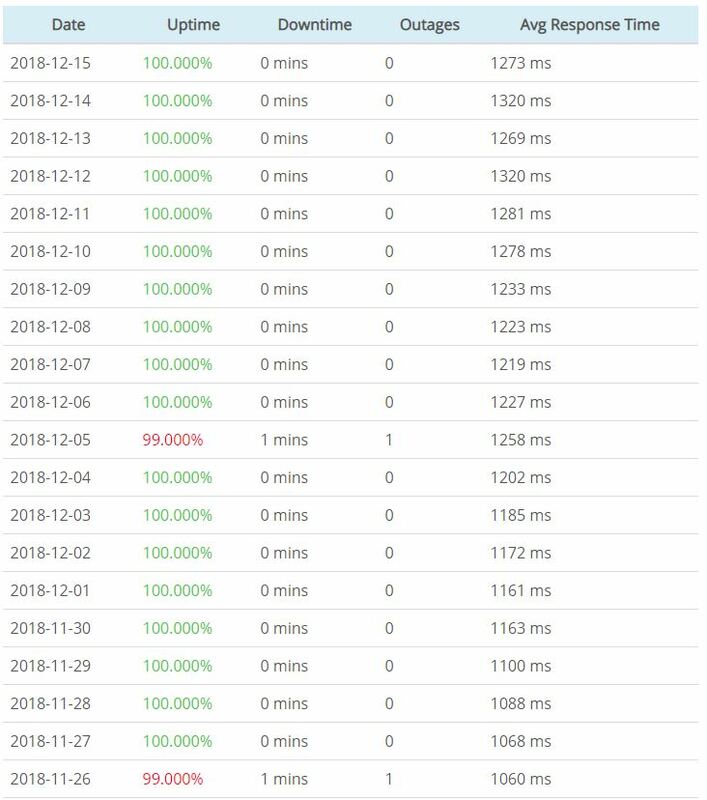 So to get a rough idea of the price to performance ratio of both Godaddy and Hostinger we will run few performance tests on two websites, one hosted on Godaddy and the other one on Hostinger. Performance test provides the real idea of how the hosting will perform when you buy it. The performance test was run on a website hosted on Godaddy servers that yielded the result with a ‘B’ grade with a score of 86. The page size and load time are given in the result image. A total 27 requests were made from the test server located in San Jose. Keep in mind that these test results are hugely affected by the server locations too. Hostinger’s performance test results show that it managed to achieve a score of 71 with a ‘C’ grade. 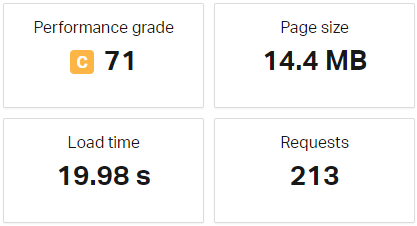 A total of 213 requests were made and a page of size 14.4 MB was loaded which took a response time of 19.98 s.
Comparing the test results from both the web hosts we can see that both of them didn’t perform well but still Godaddy managed to beat Hostinger by a slight margin. 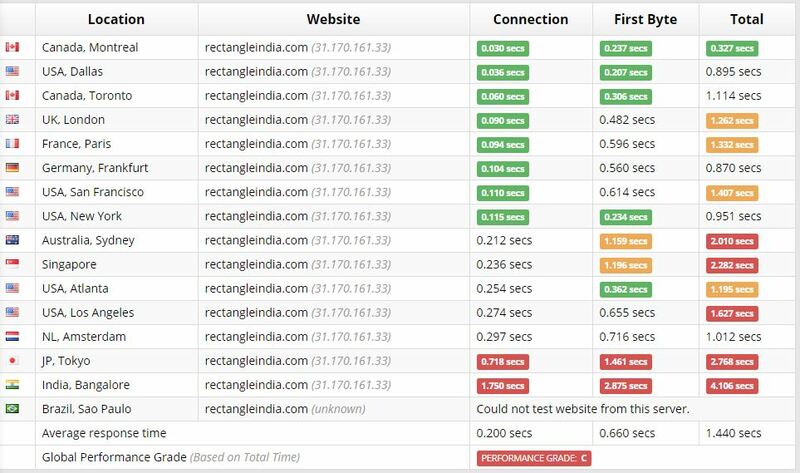 We can’t conclude that either of these two host is better than the other but we surely can say that Godaddy has better optimization than Hostinger. Time to first byte refers to the the time taken by the web server to send the first byte of data to the user once a request is made by the user to the server. This in short explains how well the servers are optimized and how fast they perform. The lower the time to first byte duration the faster the website loading speed will be. Though website loading speeds also depend upon the page size and the total number of requests but the main aspect of website speed is whether the server is responsive and fast enough to transfer the data or not. 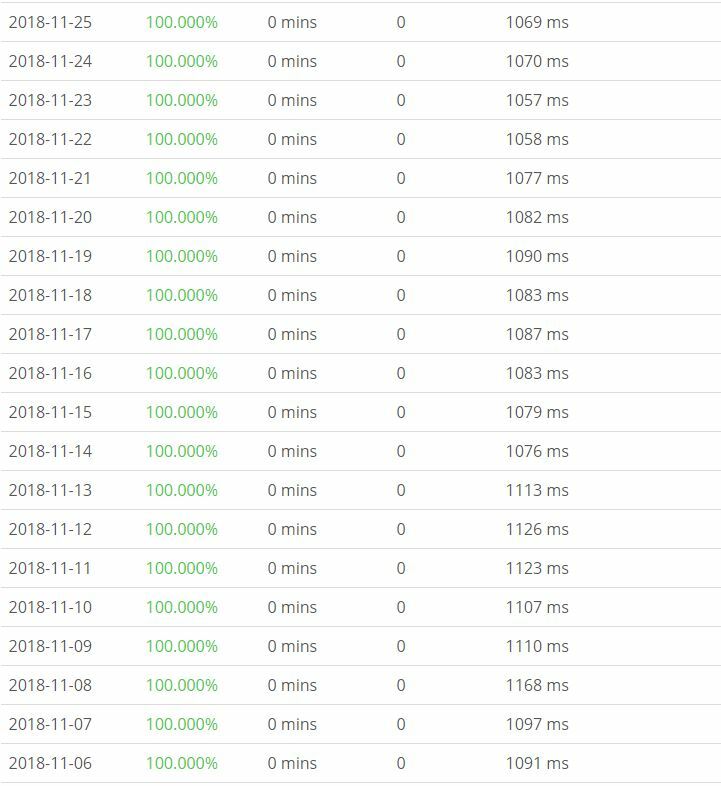 Godaddy’s TTFB test results show that the minimum time taken for the first byte was 0.368 seconds with a total time of 1091 seconds from the Singapore server. Whereas the maximum first byte time was 0.513 seconds with a total time of 1.326 seconds from the Japan, Tokyo server. The server location also greatly affects the TTFB test timings as the farther the server from website’s base server the longer it will take to transfer the data. TTFB results for Hostinger show that it took a minimum of 0.237 seconds for the website to transfer the first byte of data with a connection time of 0.030 seconds which resulted in a total time of 0.327 seconds which is slightly less than that of Godaddy. The maximum time taken by Hostinger was of 4.106 seconds which is greater than what Godaddy took. 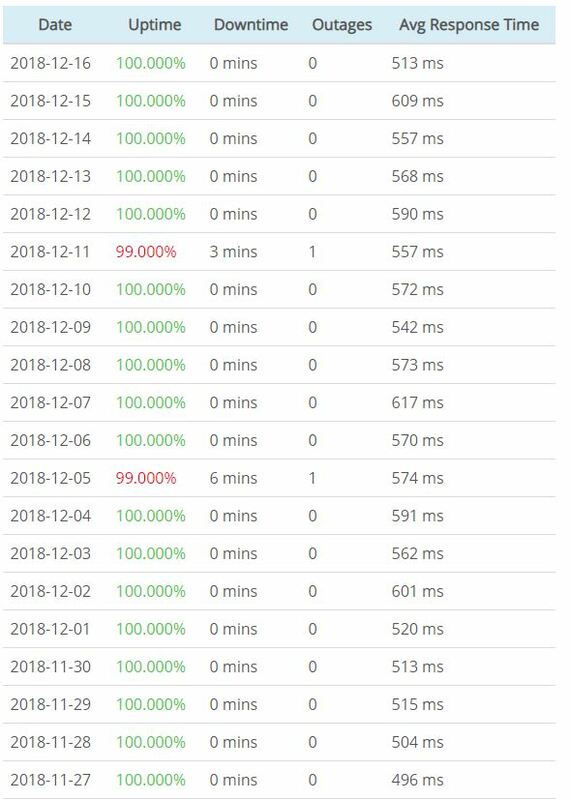 So from the results obtained from both the tests conducted on respective web hosts, we can see that Godaddy and Hostinger are equally good in terms of Time to first byte and both also managed to get the same grade ‘C’. Si it is not wrong to say that there is a tie between both the web hosts in terms of TTFB. Uptime is one of the most important factors that should not be overlooked while choosing a webhost for your website. Uptime refers to the time for which the servers of a particular web host were online and functioning properly. This includes the time where they were serving user requests through the websites hosted on them and were successfully transmitting data. The times when the servers fail to do any of this is counted in downtime. Small and infrequent downtimes are normal as server maintenance is also done during these downtimes but frequent and major downtimes are considered bad. Larger downtimes means that your websites will be unavailable to the users for that period of time. It can also mean that the web servers are not properly maintained and have technical faults. 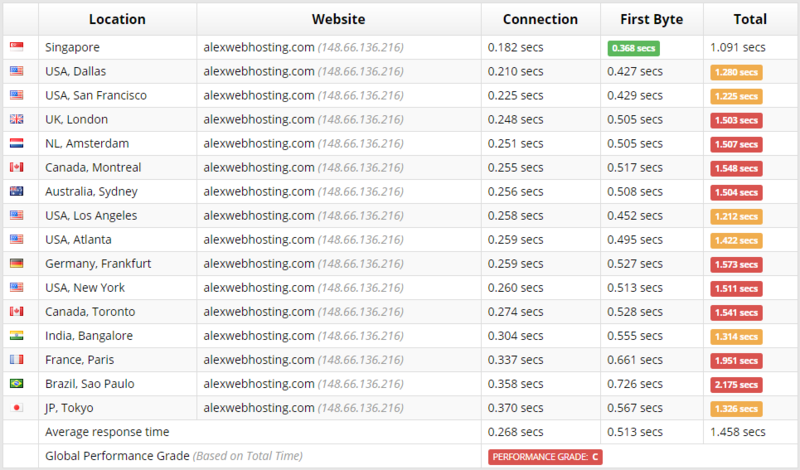 It's better to stay away from web hosts with lower major downtimes no matter how cheap plans they provide. 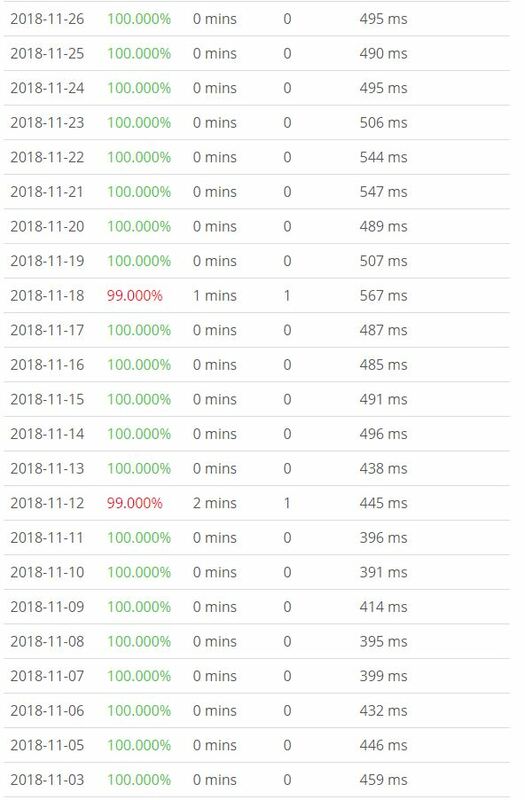 From the uptime report of Godaddy we can clearly see that over a period of one month Godaddy servers faced only 2 downtimes that too just for 1 minute. First downtime was on 26/11 and the other one was on 05/12. This shows that godaddy does keep its promise and provides 99% uptime. Uptime statistics of Hostinger shows that it had four occasions of downtime in the past month ranging from a minimum of 1 minute on 11/12 to a maximum of 6 minutes on 5/12 which as compared to godaddy is more frequent but still acceptable as it managed to maintain its guaranteed 99% uptime mark. Comparing the uptimes of both the web hosts we can say that both the web hosts did a great job of keeping their promise of 99% uptime and provide continuous services irrespective of minor technical issues which resulted in small downtimes. Customer support is a factor which most of the people ignore while choosing a webhost. Only good affordable plans should not be the thing you should be looking for. A good customer support is what makes a web hosts great. It might not seem much at first but having responsive and technically knowledgeable support team reduces your hassle by a great margin. Both Godaddy and Hostinger have 24/7/365 support that you can contact via different means to get your queries resolved. For Godaddy you get 24/7 technical and customer support whom you can contact with a phone call or via live chat. You can also email your issues to them or just raise a ticket and get your queries solved as soon as possible. Godaddy also provides regional language support so if you aren’t comfortable with English you can choose the language you want and communicate your problems to the support staff using it. Godaddy is also well known for solving your issues quickly as 24/7 support is not enough, the amount of time taken to resolve an issue should be minimum too. Similarly Hostinger also provides multiple ways to contact their support staff such as by a phone call or via live chat which usually has a waiting time under 1 minute which i pretty good. Hostinger also allows you to raise tickets which you can do by filling the general enquiry form on Hostinger’s website. You can also send email to the customer care and inform them about your issues. Hostinger also provides multilingual customer support just like Godaddy. Other than these options you also get a huge Knowledge Base with 100+ questions and answers regarding different issues which you can use to solve the issues on your own without having the need to contact the customer care. Both Godaddy and Hostinger allow payments to be made in your local currency so that if you are uncomfortable to pay in dollars due to any reason you can always do so using your local currency. Hostinger gos one step ahead in this by accepting Bitcoins too. So if you want you can pay via bitcoins too. Overall, Both Godaddy and Hostinger are equally good in terms of customer support and satisfaction. Considering all the factors presented above in the article we can conclude that Hostinger and Godaddy both are equally good in terms of quality and services. Though Hostinger has cheaper plans as compared to Godaddy but with higher renewal charges the overall cost for the plans on both the web hosts is somewhat equal. While all other features are quite equal in terms of flexibility and quality. So if you are tight on budget you may go for Hostinger or else Godaddy is the choice you should go for.